You are here: Home » Kevin Rudd and Love Letters from the Bar Table. The unanswered questions. Kevin Rudd and Love Letters from the Bar Table. The unanswered questions. There is a picture of Australian Prime Minister Kevin Rudd on the front cover of my book Love Letters from the Bar Table. This is the book that a Barrister in England said “is a marker setting a future agenda for international human rights and upholding the rules of natural justice”. A picture is worth a thousand words and the power of the front cover should not be underestimated. Ask any lawyer and they will tell you just looking at the front cover says there are many questions that need to be answered and Kevin Rudd is the main person who needs to answer them. For the book to be left unchallenged and unchecked says a lot about corruption and how far it goes up the government chain. A lot of issues in Kevin Rudd’s past are now being raised again since he was appointed for the second time as Australian Prime Minister so it worth looking at the book again. I only realised on Monday that my book is back in vogue now Kevin Rudd has been returned as PM. I remember in 2010 when he was replaced as Prime Minister by Julia Gillard that the front cover then became out of date, but he is back for a another go and so is the book. A person came up to me at a book signing and said what evidence do you have in relation to Justice Moore taking bribes. Before I had a chance to answer she said “I suppose the front cover for starters”. Another person came up to me and said “If you had the evidence Justice Moore would be in jail”. I said “If I did not have the evidence I would be in jail”. He said “Good point”. The book was published in 2009 and became available online in September 2009 on most online bookshops. It chronicles correspondence that shows corruption in the judicial system and names judges and magistrates amongst others. Phillip Taylor is a Barrister in England and has done over 200 book reviews, mainly in the legal field, reviewed my book in January 2010 and published his review on several sites. In June 2010 Mr Taylor posted a YouTube review which was after Kevin Rudd lost the Prime Ministership which is below. Above is Phillip Taylor’s YouTube book review. It is well worth watching as it is an independent review and by someone who fully understands the power of the content. Kevin Rudd also gets a mention. I did book signings in late 2009 and 2010 which included a number of Angus and Robertson stores in Sydney, the Sydney University Co-Op Bookshop and Borders in Canberra. The Sydney University and Borders book signings ended up being some fun and games to say the least. Word had come down the line to undermine the book signings but they could not be stopped. The book would not have survived if there was no evidence of corruption as Mr Moore and the Attorney-General would have taken legal action to have it withdrawn which they could have done very easily if there was no evidence. Also I would have been charged with contempt of court for scandalising the court. As it stands the book is freely available and is in libraries across the country including the National Library of Australia, National Museum of Australia Library, State Library of NSW and NSW State Parliamentary Library as well as numerous University Libraries. As you might have noticed there is a picture of me holding a sign that says “Justice Moore Federal Court of Australia takes bribes” on the front cover of the book. So where is Justice Moore now? He resigned in July 2011 some 10 years before he reached the mandatory retirement age of 70. He was nothing more than a running joke in the Federal Court by then as everyone in the court knew about the book. 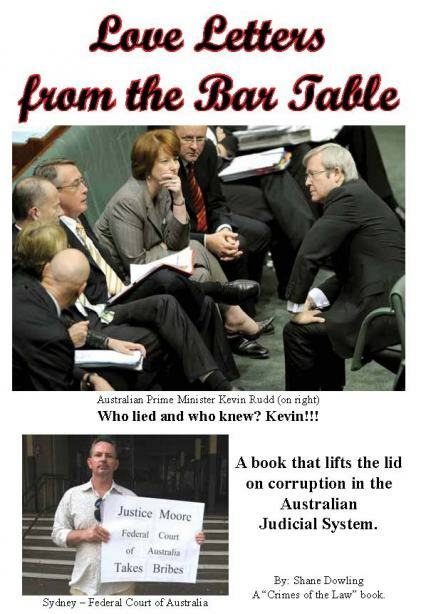 Mr Shorten is well aware of the book and that Michael Moore is corrupt as I wrote to him personally in 2010. So why did he appoint Michael Moore to those cushy positions? Because he does not care and was looking after a good Labor Party boy. It is one thing to jump up and down and say corrupt judges, but you need the evidence and it needs to be documented, and that is what the book does as well as this site. You do not need to look beyond the front cover to see there are some serious questions that need and have to be answered. If the book keeps on being pushed, it is just a matter of when and who will answer those questions. The big question that Mr Rudd needs to answer is why he has never taken any action in relation to the book to protect the reputation of the courts. Part of the answer is he has been busy corrupting the courts with his own dodgy judicial appointments. This post is not about promoting my book. I have had ample opportunity for that and even if I do get a few extra sales then it will go towards growing this site which is in the public interest. The post is about making Kevin Rudd accountable and the front cover alone does that whether he does something or not. Everyone should know how he turns a blind eye to judicial corruption. In 2009 when I published the book I had very little support and road blocks were put up at various times. Now is a different story as there is support for this site and for what I am trying to achieve. Politicians worry about their legacy, especially Prime Ministers and Kevin Rudd is no different. Let’s help his legacy before the next election. Put the pressure on Kevin Rudd, send a link to this post to anyone and everyone and make it go viral. Like it on Facebook, tweet it on Twitter etc. and come back tomorrow and do it again and tell your friends to do the same. Send it to the federal politicians, the media and others. The politicians and media might not do anything but it holds them to account as well. I can write a book and posts on the this site and promote it to a degree but the rest is up to you, so play your part and help spread the word. Mr Rudd will not be happy that is for sure but there is nothing he can do. You can follow this website by free email notification at the top right of this page and about twice a week you be notified when there is a new article published. I bought this book over a year ago and can highly recommend it. For anyone who wants a good look at what happens when an ordinary person comes up against the corrupt old boy and girl network. Proof that the system exists to protect the bigwigs. Democracy is nothing more than a pr exercise in this country. I bought the book initialy as a donation but it turned out to be an investment,Shane has the ability to print the facts and sometimes they are confronting but after going through six years of Labor “government” shared by two bent Prime ministers both with an ego problem and habit of making promises they do not intend to keep, they are more plausable than confronting. Natural justice is a very rare comodity in Australia and the judicial system and the governance are operating in the defence of number one and we as the public are not number one. While Labor has the power there is nothing they will not do to keep it and whatever happens they will walk away Scott free in most cases. Gillard and Rudd are responsible for many fatalities during their Leaderships the Queensland coroner said so in as many words and that is just a few of their mistakes, they should be brought to justice and tarred with same brush as the people smugglers. Allan from Myalup.WA..
Shane, I am so pleased that you put up this post to remind people, what we are living with. I have the book and just by observing what has happened these last years with court-cases involving people we hear about all the time, I have seen that this corruption is happening in front of our eyes all the time. before we have another election, as we certainly need some questions answered satisfactorily. We need the questions answered and the cases investigated thoroughly, before we sink further in the mess we are in. I’ve just forwarded an e-mail to all my contacts recommending this book, and have advised them to read it pronto! I too bought the book. It was a real eye opener! I wanted to lend it to someone to read but she simply wasn’t interested. Shared this article too on Facebook, but it seems like people are not all that interested (sigh). How on earth do we get people out of their “don’t care” states? That’s precisely how these crooks get away with their crimes. Oh well. Election time is just around the corner… I will grab a KCOA t-shirt and wear it to the polling booth. Suggest everyone else does the same. And when the ALP goons hand me their how to vote cards… I will point to my t-shirt and boy are they going to cop an earful from me! It’s time to start making a BIG statement. UPDATE: I bought the t-shirt today. Come on Krudd, bring on the election now so we can hopefully purge the lot of you.